“Cumberland Glory” is the story of the railways around Cumberland’s border city of Carlisle. Citadel station witnessed the passing of many trains, among them the “Royal Scot”, “Mid-day Scot” and “Waverley”. 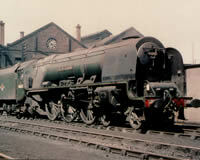 Motive power included Princess Coronation Pacifics, Jubilees, Black Fives and Patriots. Railtours brought in locomotives from all the big four companies as well as Scottish preserved engines such as “Glen Douglas” and Caley Single No.123. Gresley A4′s came from the Waverley Route. Kingmoor Shed is visited portraying normal working locomotives and the visitors off of railtours. Its turntable played host to a Western A2 Pacific “Blue Peter” during the period covered in this video which begins in 1962. Branches and main lines radiating from Carlisle are visited, including Silloth and Langholm. There is magnificent action from the Settle and Carlisle line and the West Coast main line over Shap. The transition to diesel traction prior to eventual electrification in 1974 is seen with locomotives such as Class 40s and 50s plus the Royal Train. From heavy freight to 46238 “City of Carlisle” cleaned for football special, from an immaculate “Glen Douglas” to a 9F struggling to Ais Gill, it is all in this story. Much of the film, in both black and white and colour, was shot by local enthusiast Brian Irwin. 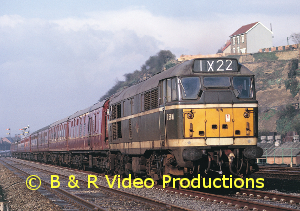 In collating Colin White’s steam films for production B & R noticed that there were enough scenes of early diesels to make a one hour programme of types of diesel traction mostly lost in BR service in the 1980′s. Certainly some liveries are gone and generally all the film was taken before the video age. So we can re-live these early diesel scenes from the 60′s and early 70′s starting with the Hydraulics of Western, Warship and Hymek classes. They are seen at work on railtours and normal service including a journey on the double-headed Hymek Swansong from Paddington to Hereford. The Blue Pullmans looking so much like early HSTs at Paddington. Class 50s double-heading the “Royal Scot” in pre-electrification days is followed by a view of “Kestrel” at a Cricklewood open day in 1969. Electric traction is represented by views of the now lost “Brighton Belle” seen in both it’s liveries. A complete journey by Channel Islands boat train along the Weymouth tramway with Class 12 haulage, 15233, having arrived behind D6529 a class 33 in blue. Deltics are well covered at Kings Cross and Peterborough and even their wanderings to Harlow and Wandsworth. We see Class 31s in green and blue liveries on a variety of workings including the Royal Train at Cambridge. The whistling Class 40s follow at Bersham, Kings Cross and Manchester Victoria when they hauled stock to Rainhill in 1980. D200 restored to its green livery is seen at Whitchurch. Memories of Peak haulage on the Midland main line is relived. Brush Type 4s in a unique form which started the new era of colourful liveries is featured by 47 164 at Chelmsford with the large Union Jack on its sides. 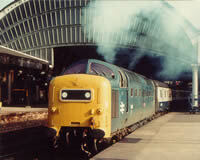 We end this look at the locos of this age with green-liveried 47s on the East Coast Main Line. All told there are 14 different classes of traction and several locomotives seen in BR service now in preservation on this compilation.